How much will I pay to have my dietary supplement labels reviewed for FDA regulatory compliance? E-mail your label to experts@dietarysupplementexperts.com. PDF or Word documents are preferred. 2. Receive a quote and timeline from us. Soon after receiving your label, we will contact you back with a quote and timeline to complete. If everything is agreeable, we send an invoice for the work. Most labels are returned within one to three days following payment. Once you receive your label back with our commentary and begin making you changes, contact us for any needed clarifications. We will also be happy to review your changes to ensure that they were made properly. The Problem: The client received a FDA Warning Letter citing multiple label violations, including disease claims being made on their labels. At the time we were contacted for help, just a few days remained to respond to the FDA about how the violations were going to be remedied. 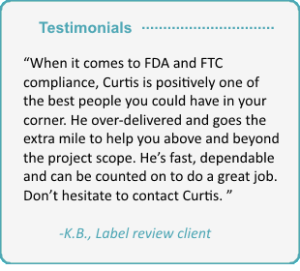 The Approach: We reviewed the Warning Letter and helped develop responses that would assure the FDA that the client was committed to making the necessary corrections and product repackaging in a reasonable timeframe. Several labels were subsequently reviewed and edited for submission to the FDA. The Outcome: New compliant labels were printed and used for repackaging of the products. The client’s products remain in the market with no further actions from the FDA. The Problem: After being let down time and time again by their current label review provider, the client contacted us to review a single label to try out our service. The Approach: We reviewed the client’s label in less than one day. The comments were easily incorporated by the client’s graphic designer. We provided a second review of the label and all issues were perfectly addressed. The Outcome: We now receive labels from the client on a regular basis, striving to meet or exceed that initial experience. The Problem: A foreign company wanted to begin selling their products through a major online retailer in the U.S. Their current labels were not U.S. compliant, and they needed help converting them for submission to the retailer for onboarding. The Approach: Because the client’s graphic designers were not familiar with the U.S. label regulations, they outsourced not only the label conversion, but the graphic design to us. We worked with our designer to make all of the needed compliance edits, but maintain the look and feel of the client’s brand image. In a matter of days, we provided the client with new label art files ready to be sent to the printer. The Outcome: The client successfully began selling their product through the major online retailer. We remain their resource for ongoing label conversions. The Problem: A gentleman wanted a basic label created for a product concept that he wanted to send out for quotes to manufacturers. The Approach: After receiving the client’s formulation information and having a few questions addressed, we were able mock up an essentially compliant label for the client. The Outcome: The gentleman was very happy to see his ideas put into a label template. He was able to secure a manufacturer to make the product to nearly the specifications of the label. The Problem: The client had used a CMO to produce dozens of products in their relatively new line. The CMO also provided them the content needed to create and print “FDA-compliant labels”. After finding some problems in the labels, they realized it would be wise to have all of them reviewed by someone well versed in the regulations. The Approach: A large batch of the client’s labels were sent for review. Every label had significant errors in ingredient naming, formatting, and more. The client was initially shocked by the suggested revisions, and unsure to trust our review or the CMO’s “approved” labels. To put their minds at ease, we provided the regulations and excerpts of Warning Letters relating to the errors. All of our revisions were ultimately accepted. The Outcome: The client was disappointed with having so many non-compliant labels, but glad that we were able to fix all errors and decided to have us review all future CMO labels.